At the fragrance manufacturer Atelier Cologne wonderful perfumes, soaps and scented candles are produced. The Mistral Patchouli perfume and the matching accessories such as soaps and candles transport you to a summery, Mediterranean-inspired world of fragrance. The perfumer responsible, Jérôme Epinette, therefore sets store by well known aromas from which he creates an interesting fragrance creation. The intensive Mistral Patchouli perfume starts with a substantial base note consisting of benzoin, vetiver and patchouli. Floral elements of geranium and iris are added in the heart note. Incense caters for the mysterious aspect. The top note enchants with fruity and spicy components: Grapefruit, star anise and pepper round off the overall fragrance creation stylishly. If you like fragrances you will find your favourite fragrance in the Collection Matières Absolues! 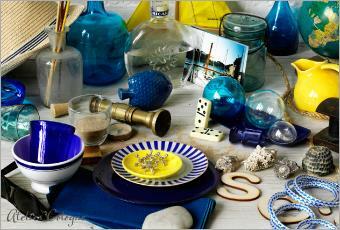 Atelier Cologne offers you a variety of perfumes, soaps and scented candles. You can coordinate these products, which are all made in France with affection and the greatest care, creating your own personal world of fragrance. Supplement your perfume with the matching soap. 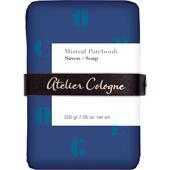 The bar of soap from the Mistral Patchouli range is a highlight in your bathroom! The soap has an intense blue tone and has a leather band around it. The soap shows its caring properties during use. High-quality and natural ingredients like aloe vera and shea butter ensure a creamy, fine-bubbled foam. The skin smoothing effect of the soap spoils you from top to toe. The soap is pure pleasure when washing your hands here and there! The matching room fragrances are provided by Atelier Cologne in the scented candle from the Collection Matières Absolues. Observe the quietly flickering flame and experience the pleasant scent that indulges all your senses. The atmosphere in your home benefits from the delicate fragrance experience and awakens your longing for far-away places.